Sure, your cat might not seem particularly interested in the current presidential race (and who could blame him, am I right?). But now even the most apolitical of kitties can get in on the action - by taking a claw to the most controversial of candidates. 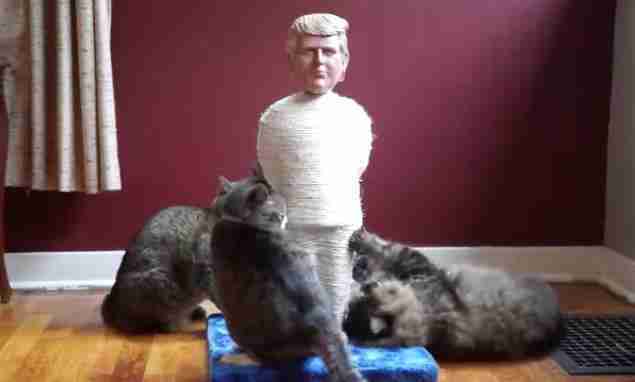 Upstart company Politikats has unveiled a rather unusual product designed especially for felines: this scratching post made in the likeness of Donald Trump! The scratching posts' makers, on Politikats' Facebook page, say that they designed it "to enhance the beauty of your home" - and what home wouldn't be enhanced with a little scratchable Donald Trump? "We hope to bring attention to the flaws of our current systems of governance and hold our leaders accountable in a different and fun way." Trump isn't the only politico to get the scratching post treatment; the company is also offering a little President Obama, Vladimir Putin and Benjamin Netanyahu for your cat to claw at. Politikats is hoping to get their scratching posts on the market by this summer, and is currently raising funds to start production. For more information, check out Politikats' Kickstarter page.